Is there a better alternative to iCAR? Is iCAR really the best app in Chat category? Will iCAR work good on macOS 10.13.4? 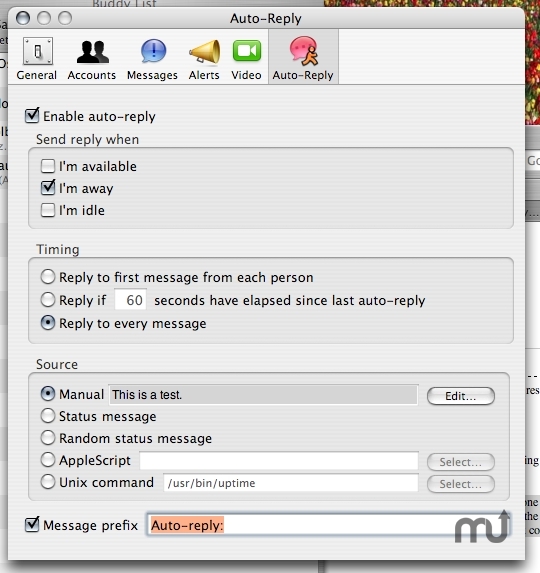 iCAR is a plugin for iChat that implements an advanced auto-reply function. Replies may be sent after every message received, after only the first one from each buddy, or only if a certain time interval has elapsed. They may be sent when you are available or idle, not only when you have set yourself as "away". 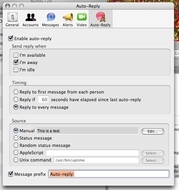 The content of an iCAR auto-reply may be your iChat status, entered manually, selected randomly, or even generated dynamically by an AppleScript or a Unix command. Fixed a rare crasher introduced in version 0.8. Now compatible with iChat 3.0 and Tiger. Support for all other versions has been dropped. Chats are no longer automatically accepted when iCAR is turned on. Mac OS X 10.4 or later, iChat 3.0.
iCAR needs a rating. Be the first to rate this app and get the discussion started!